Manning was constitutionally justified in refusing to give grand jury testimony. So is everyone. The secretive process is legally, morally, and ethically unconstitutional, used "to entrap and persecute activists for protected political speech," she explained. She invoked her First, Fourth and Sixth Amendment rights, along with the right to remain silent, refusing to answer questions from law enforcement or court officials, an internationally recognized right. Her fundamental rights aren't good enough in police state America, the rule of law long ago abandoned. Manning's First, Fourth, Fifth, Sixth, and Eight Amendment rights were violated. She was wrongfully imprisoned for invoking her free expression rights, justifiably revealing US high crimes of war and against humanity in Afghanistan and Iraq. Subjecting her to unreasonable searches and seizures violated her Fourth Amendment rights. Her Fifth Amendment rights of due process, protection from self-incrimination, and possible double jeopardy were violated. So was her Sixth Amendment right of a public trial represented by counsel, an impartial jury, and nature of possible charges against her. Subjecting her to cruel and unusual punishments, including the threat to her freedom and well-being, by demanding she testify before a grand jury in secret without counsel violated her Fifth, Sixth, and Eight Amendment rights. Instead of being a shield against oppressive, arbitrary authority, the US grand jury system is a sword against fundamental constitutional rights because of its manipulative practices, prosecutors doing whatever it takes to get indictments. Subpoenaed individuals are denied the right of counsel when questioned. No judge is present to assure fair and legitimate proceedings. Witnesses risk unwitting self-incrimination, even when guilty of no crimes. Prosecutors game the system to their advantage - all of the above why Manning invoked her constitutional rights, refusing to cooperate, unwilling to risk unwitting self-incrimination, along with potentially helping the prosecutor build a phony case against Julian Assange - why the grand jury she was called before to testify was convened in the first place. 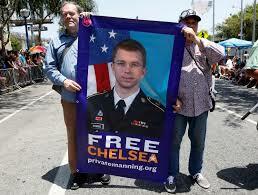 For resisting the Trump regime's attempt to incriminate her through grand jury testimony, invoking her constitutional rights, refusing to respond to unjust questioning, Manning was remanded into federal custody on March 8. Falsely charged with contempt, she was ordered detained indefinitely. On orders from the Trump regime, she's held in solitary confinement - a flagrant 8th Amendment violation, prohibiting cruel and unusual punishment. Isolated 22 hours a day, she's prohibited from contact with other prisoners, as well as denied access to books, other reading material, and the law library. She's only allowed out of her cell from 1:00 - 3:00 AM. On Monday, her legal team filed a motion with the US Court of Appeals for the Fourth Circuit, seeking her immediate release on bail while her unlawful arrest order is appealed. The appeal states "Ms. Manning timely filed her notice of appeal, and now requests that this court grant bail pending the resolution of the appeal." Under US law, she's entitled to bail while appealing charges against her. She poses no flight risk, nor a danger to anyone. According to her legal team, denying her bail violated appellate rules, requiring the court to explain in writing why bail was refused. "Without explicitly ruling on the motion for bail, he ordered Ms. Manning to custody of the Attorney General. He issued no written denial or justification therefor, nor did he issue any verbal rationale for denial of bail." Her lawyers also cited her medical needs and transgender status. They accused the Trump regime of illegally surveilling her before her grand jury appearance, stating as well that she's constitutionally permitted to remain silent during grand jury questioning. Prolonged isolation is a form of torture. The Trump regime's aim is three-fold - punishing her again for revealing US high crimes of war, why she was unlawfully imprisoned for seven years until Obama commuted her unjust sentence, along with forcing her to unwittingly self-incriminate herself and provide testimony to be used against Assange. According to Manning's attorney Moira Meltzer-Cohen, the appeal on her behalf "is the strongest on a grand jury contempt (charge she has) ever seen…"
She believes release should be granted, adding Judge Hilton "acted without considering clear legal mandates and this error, including the denial of release, must be corrected in the appellate court." Ahead of her re-incarceration, Manning expressed willingness to "face the consequences." She resolutely vowed to stand by her principles, refusing to surrender to Trump regime viciousness.